The charging stallion. The trusted steed. The wild mustang- all these are staples of the old west. A man's horse can figure almost as highly in local legends and history as the man himself, and they certainly add to the outlaw's image. This isn't all they do, however. Horses can be powerful, dynamic and useful allies for anyone looking to build their own legend. 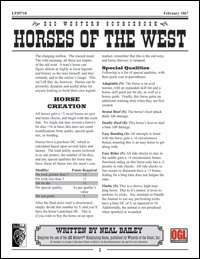 This 6 page PDF is just the sort of thing needed for GMs to add depth to any great d20 Modern campaign world focusing on the old Wild West. This title was added to our catalog on February 18, 2007.